Woods and JP McManus in 2000Tiger Woods must be considered a doubtful starter for next year's JP McManus Invitational Pro-Am and the Open at St Andrews. A simple precaution? Or perhaps a word to the wise from his close pal JP McManus? If it's the latter, then we can safely rule Woods out of the (British) Open, which takes place at St Andrews the following week. Announcing commitments from McIlroy, Lee Westwood, Paul Casey and Ian Poulter on December 1, the event release declared: "Tiger Woods, the world’s number one, and Pádraig Harrington have previously committed to playing in the Pro-Am." A spokesperson for the event's PR consultants DMC Communications said: "We took Tiger out of the release based on his own statement last week saying he was taking an indefinite break. We have had no news from Tiger or his management." The PR firm denied that it had been asked to remove Woods' name at the behest of Mr McManus, who is a close personal friend of the American. Along with co-owner Dermot Desmond, McManus gave Woods and Elin Nordegren the run of the exclusive Sand Lane Resort in Barbados as a wedding present when the couple married there in 2004. 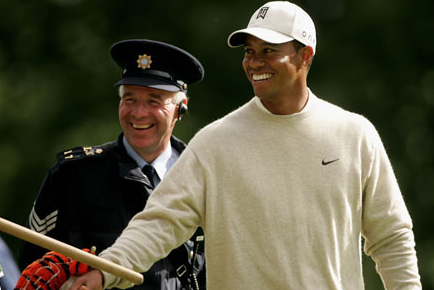 Woods didn't win the JP McManus Invitational in 2005 but said he was glad to come to Ireland to help out his friend, who has used the golf tournament (held every five years) to raise more than €55 million ($80m) since 1990. 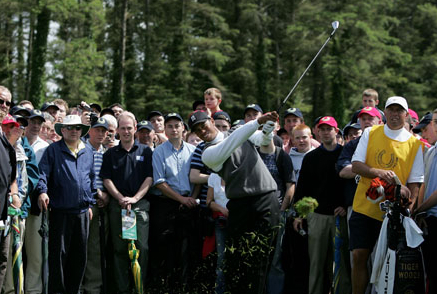 "It's special for all of us to come and support a good friend of mine," said Woods, who had flown through the night from the Western Open to tee it up at Adare Manor. "This is all for JP. I am here as a friend. We come here as friends and to support him, not as some of the top players in the world."